The term “Trigeminal Autonomic Cephalalgia (TAC)” was first coined by Goadsby and Lipton  to include a group of headache disorders characterized by moderate-to-severe, short-lived head pain in the trigeminal distribution, with accompanying unilateral cranial parasympathetic autonomic features, such as lacrimation, rhinorrhea, conjunctival injection, eyelid edema, and ptosis. It is now well established through experimental and human functional imaging that these syndromes activate a trigeminal parasympathetic reflex with the clinical signs of cranial sympathetic dysfunction being secondary. 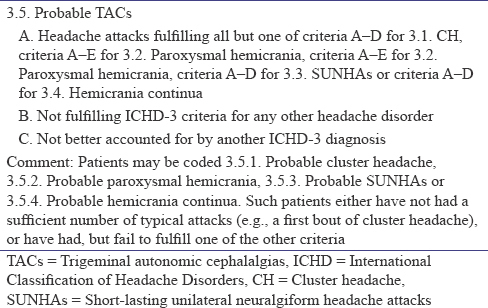 The term TACs when first introduced in ICHD-2 (2004) covered 3 headache types. Cluster headache (CH), chronic and episodic paroxysmal hemicrania (PH), and short-lasting unilateral neuralgiform headache attacks with conjunctival injection and tearing (SUNCT). In the current ICHD-3 beta classification (2013), the TAC group has been expanded to include CH, PH, SUNHAs and their 2 subforms-SUNCT and SUNA with cranial autonomic symptoms (SUNA) and hemicrania continua (HC). Although the entities included under the TACs seem broadly similar, they differ in attack duration, frequency and their response to different treatments. Recognition of these syndromes is important because treatment options vary. They are rare but not difficult to recognize and subclassify. It is useful to know the background to the origin of this term “TAC” and its relevance to clinical practice. Short-lasting headaches were always known to be different from migraine and were important to recognize because of their highly selective response to treatment. It was for the first time in 1997 that Goadsby and Lipton  suggested a nosological analysis and pathophysiological basis on which they divided these short-lasting primary headache syndromes into those with marked autonomic activation and those without autonomic activation. In their paper, Goadsby and Lipton listed CH, episodic and chronic PHs, SUNCT syndrome and cluster-tic syndrome under the heading of short-lasting headaches with prominent autonomic features. Trigeminal neuralgia (TN), idiopathic stabbing headache, cough headache, benign exertional headache, headache associated with sexual activity and hypnic headache were grouped under the heading of short-lasting headaches with sparse or no autonomic features. It is useful to be aware of the evolutionary changes to this group of short-lasting headaches with autonomic features across different editions of the ICHD Classification. Classification schemes are necessary for standardizing approaches to care and research by minimizing inter-observer variations. Historically, the first modern attempt at classifying headache disorders was by an ad hoc committee formed by the US National Institutes of Health in 1962. They devised a scheme which consisted of brief definitions of a limited number of headache types. The first International Classification of Headache Disorders (ICHD) was published in 1988. This was the first step to providing the much-needed credibility to 'Headache Medicine'. The first version of the ICHD-1 (1988) was largely based on the opinion of experts. The International Classification of Headache Disorders, 2nd edition (ICHD-2) was published in 2004. Shortcomings of ICHD-1 were addressed in the second classification. The second edition ICHD-2 (2004) was based on better scientific data, but many changes were still based on consensus of experts. For ICHD-3 beta, first published in 2013, more evidence was available. The ICHD-3 like ICHD-2 is divided into 4 parts – Part-1: Primary Headaches, Part-2: Secondary Headaches, Part-3: Painful Cranial Neuropathies, other Facial Pain, and Part-4: The Appendix. The TACs are included in Part 1. Changes to this group of short-lasting headaches with autonomic features across the 3 editions of the ICHD Classification are discussed below. The term TACs had still not been coined when the ICHD-1 was published in 1988. In ICHD-1, there were only 2 short-lasting headaches with autonomic accompaniments that were included in group 3, namely, CH and chronic PH [Table 1]. CH was previously known by many other terms such as ciliary neuralgia, histaminic cephalalgia, Horton's headache, Sluder's neuralgia, Sphenopalatine neuralgia, migrainous neuralgia (of Harris), and vidian neuralgia. 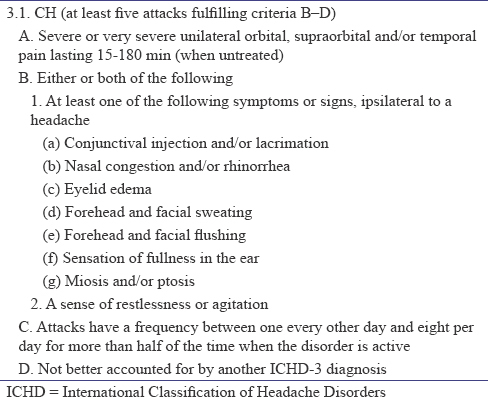 In ICHD-1, all these terms were replaced by the term 'Cluster Headache'. There was a category 3.1.1 termed CH periodicity undetermined in addition to episodic and chronic CH. The category chronic CH 3.1.3 referred to CH with attacks for more than 1 year without remission or with remission lasting <14 days. This category was divided into 3.1.3.1 chronic CH unremitting from the onset and 3.1.3.2 chronic CH evolved from episodic. There was no category for episodic PH. 3.2 was the rubric for chronic PH, and finally, there was a category 3.3 that included CH-like disorder not fulfilling above criteria. This category included headaches that fulfilled all but one of the criteria for CH and CPH. 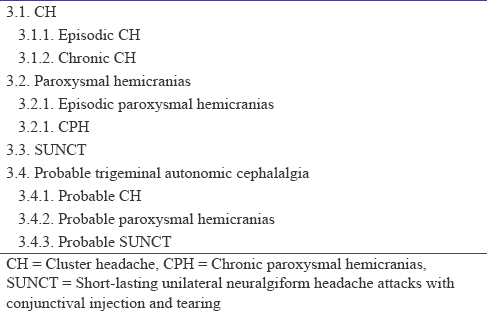 In the second edition of the ICHD-2 (2004), these short-lasting headaches with autonomic features were included under rubric 3 as “CH and other Trigemino-autonomic cephalalgias” [Table 2]. In ICHD-2 (2004), a sense of restlessness or agitation as a possible accompaniment during a CH attack was added to the diagnostic criteria [Table 3]. The duration of remission periods in chronic CH was also changed from a maximum of 14 days to 1 month. PHs were included under the rubric 3.1 and 3.2. The episodic and chronic forms of CH and PH were based on the presence or absence of an intervening pain-free period or remission period lasting ≥1 month. It was mentioned in the comments section that chronic CH could arise de novo or evolve from the episodic subtype. At the time of ICHD-2, there were patients seen with very short-lasting headache and only one of conjunctival injection or tearing or other cranial autonomic symptoms such as nasal congestion, rhinorrhea, or eyelid edema. This ultra-short-lasting headache was termed SUNCT and was included under rubric 3.3. Mention was made in ICHD-2 in the comments section that patients may be seen with only one of conjunctival injection or tearing or other cranial autonomic symptoms such as nasal congestion, rhinorrhea, or eyelid edema may be seen. This was termed SUNHAs with cranial autonomic symptoms (SUNA) and was included in the Appendix as A3.3. It was thought that 3.3 SUNCT could be a subform of SUNA. Mention was made in ICHD-2 that SUNCT and SUNA attacks can be of 3 types-single stab attacks, groups of stabs or a sawtooth pattern with a group of stabs occurring in quick succession. It was also mentioned in the comments section that the most common mimics of SUNCT were lesions in the posterior fossa or involving the pituitary gland and when patients are seen into an overlap between 3.3 SUNCT and 13.1 TN they should receive both diagnoses. It is important to note that at the time of the ICHD-2 classification, HC was included under the heading of “Other Primary Headaches” and was therefore not included here. The last category of probable TAC under rubric 3.4 was also a new addition in ICHD-2. This included headaches that were believed to be a subtype of TAC but which did not quite meet the diagnostic criteria for the other subtypes under group 3. If a patient is missing a single criterion for an ICHD-3 diagnosis, the headache diagnosis becomes “probable.” Under 3.4, the subdivisions were 3.4.1 probable CH 3.4.2 probable PH and 3.4.3 probable SUNCT. A probable diagnosis should raise the suspicion of a secondary cause for the TAC. An MRI should form part of the workup. With more evidence accumulating, there were significant changes to this group 3 which was now termed TAC. The entities included under this heading are listed below [Table 4]. The diagnostic criteria for CH have been listed in [Table 5]. In ICHD-3 beta, there have been some additions to criterion C of CH which now includes forehead and facial flushing and sensation of fullness in the ear and a sense of restlessness or agitation. It remains to be seen whether the addition of these 2 criteria are helping in the diagnosis. One-third of patients reported ipsilateral ear fullness and 20% reported ipsilateral facial flushing attacks. There is no consensus in literature regarding facial flushing in CH. The additional diagnostic value of these 2 symptoms seems low and the diagnostic gain is limited. The use of the word “chronic” for CH continues into ICHD-3 beta. It is used to mean CH without attack-free periods. There was an option to use the words remitting and nonremitting. Furthermore, the diagnostic criteria for CH are too lengthy and have not been field tested. Unlike CH, the ICHD-3 beta criteria for PH do not list restlessness or agitation. A new entry to ICHD-3 beta group 3 was the category of SUNHAs with which was included as rubric 3.3. Between ICHD-2 and ICHD-3 beta, there was growing evidence of another entity similar to SUNCT with signs of autonomic dysfunction, but without lacrimation. Hence, in ICHD-3 beta, rubric 3.3 includes the broad heading of SUNHAs, within which are the 2 subforms 3.3.1 SUNCT and 3.3.2 SUNA which is now moved from the Appendix to the main classification. Both these subcategories had episodic and chronic forms depending on the presence or absence of remission or pain-free periods lasting 1 month or more. ICHD-3 beta has also lengthened the duration allowed for SUNCT and SUNA attacks from 240 s to as long as 600 s and the attack frequency ranged from 3 to 200/day. 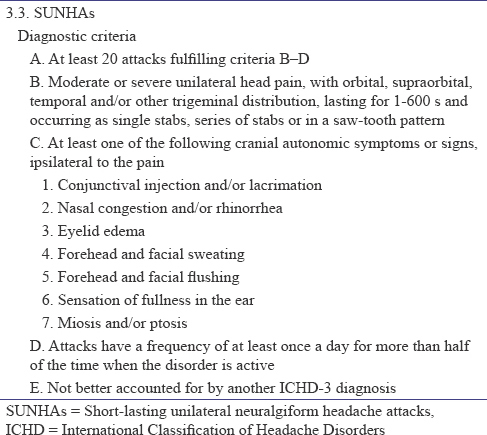 Under criterion C, for SUNHAs, ICHD-3 beta has additionally included forehead and facial flushing and sensation of fullness in the ear as for CH [Table 6] and [Table 7]. HC, earlier placed in the “Other Headaches” category in ICHD-2, is now included under the TACs in group 3 as rubric 3.4 due to its association with similar autonomic symptoms. The main difference is the continuous pain with side-locked pain that is responsive to indomethacin. The background pain of HC is more severe than the interparoxysmal pain of other TACs. This shift of HC to the group of TACs is also supported by imaging data. Because of similarity in pathophysiology, clinical features and treatment response, HC is now labeled as a TAC. The cranial autonomic symptoms in the HC occur with the exacerbations, not with the baseline pain. A sensation of a foreign body is often reported in the ipsilateral eye in HC. HC can be remitting or unremitting [Table 8]. All of the TACs manifest with autonomic features and occasional sympathetic paresis in the form of a partial Horner's syndrome. Duration of the TACs is the most important differentiating feature that is included in the criteria. HC is continuous. CH attacks last between 15 and 180 min. PH attacks last between 2 and 30 min. Moreover, the duration of SUNHA which includes SUNCT and SUNA is measured in seconds and varies between 1–600 s. The longer the name of the TAC entity, the shorter is the duration. There may be an overlap in the duration of attacks between CH, PH, and SUNHA. Response to indomethacin will decide the diagnosis in such a situation. Chronic CH will have headaches daily or near daily and will not be free from a CH attack for any period of a month or more in a given year. The periodicity feature and the low-level interictal pain seen in CH patients are not included in the criteria of ICHD-3 beta. For both CH and HC, in atypical situations when autonomic features are not present as can happen rarely, a sense of restlessness or agitation is an important criterion. This degree of agitation is not noted with PH or SUNHA. In PH, there are episodic (EPH) and chronic (CPH) subforms. The distinction is similar to that of CH. CPH is more common than EPH criteria with CH. The diagnosis of PH is confirmed through an absolute response to indomethacin. In ICHD-3 beta, the category SUNHA includes 2 subforms SUNCT and SUNA. Both are very brief headaches with autonomic features and can be triggered by cutaneous stimuli., SUNCT was named so due to the prominence of conjunctival injection and tearing, but a number of patients lacked one of these features, and therefore were described as having short SUNHAs with cranial autonomic symptoms (SUNA). For SUNA, the requirement is the presence of one or neither of conjunctival injection or tearing but not both. SUNA is SUNHA minus the red-eye or tearing, so SUNA and SUNCT are very near similar. It has been suggested that SUNCT forms the majority subset of SUNA, but currently it is classified as a separate subtype. There is no clear data on whether SUNCT and SUNA are discrete entities or variants of the same disorder. For the present, the classification committee has suggested that SUNCT may be a subset of SUNA. In a functional imaging study, activation was positive in SUNCT and negative in SUNA. Further research will help differentiate if these are 2 distinct subtypes of the same syndrome or in a continuum with variable autonomic features. SUNHAs and TN may have many similarities. In SUNHA, pain is maximal in V1 region; cutaneous triggering may be present, the attacks peak within 2–3 sec, but unlike in TN there is no latency or refractory period. V1 TN is uncommon; so the location and absence of autonomic features help distinguish between SUNHA and TN. SUNHA is not indomethacin responsive. Secondary headaches can manifest as SUNHA. It is therefore mandatory to image all cases of suspected SUNCT/SUNA. HC is the only TAC that is continuous most of the time; the headache is side locked, moderate and associated with cranial autonomic symptoms with intermittent exacerbations. Agitation is a feature of HC. The headache should be continuous for at least 3 months. There is a complete response with indomethacin. Many patients with HC have additional features and variable presentations. Exacerbations of HC can mimic migraine or cluster. In ICHD-3, HC is subdivided into remitting and nonremitting type. For HC, the remitting subtype is interrupted by remission periods of ≥1 day without treatment. Cittadini and Goadsby reported photophobia and phonophobia in around 75% of their HC patients, ipsilateral in about 50%. Therefore in cases with unilateral photophobia, it is important for the clinician to start thinking about TACs. TACs are uncommon headaches that are often misdiagnosed. Since treatment differs based on right diagnosis, it is important to recognize these entities in practice. Knowledge of how the criteria for this rare group of short-lasting headaches with autonomic features evolved over the years from one classification to another will aid in earlier recognition of the TACs. All TACs need careful imaging of the sella and posterior fossa to rule out secondary causes. Olesen J. 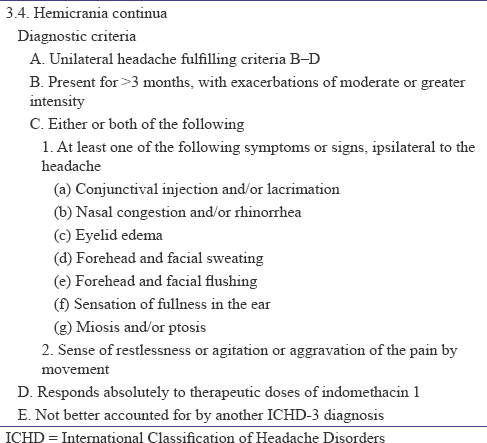 Problem areas in the international classification of headache disorders, 3rd edition (beta). Cephalalgia 2014;34:1193-9. Olesen J. From ICHD-3 beta to ICHD-3. Cephalalgia 2016;36:401-2. Ad Hoc Committee on Classification of Headache of the National Institute of Health. Classification of headache. J Am Med Assoc 1962;179:717-8.
de Coo IF, Wilbrink LA, Haan J, Ferrari MD, Terwindt GM. 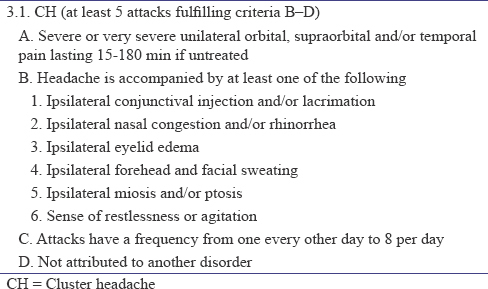 Evaluation of the new ICHD-III beta cluster headache criteria. Cephalalgia 2016;36:547-51. Cohen A. 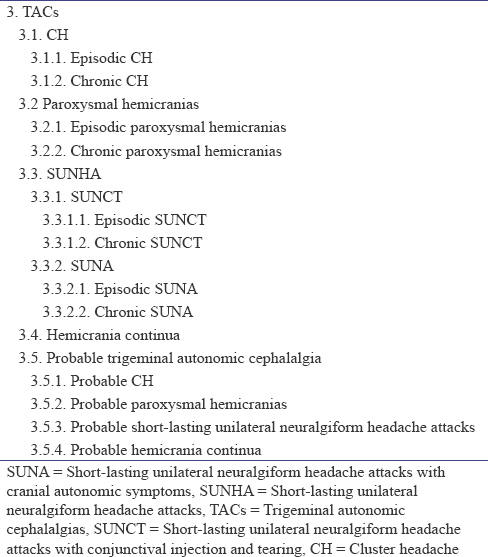 SUN: Short-lasting unilateral neuralgiform headache attacks. Headache 2017;57:1010-20. Benoliel R, Sharav Y, Haviv Y, Almoznino G. Tic, triggering, and tearing: From CTN to SUNHA. Headache 2017;57:997-1009.